After harvesting kohlrabi from my garden, I was thinking it might pair well with the lamb stew meat I had purchased from Whole Foods, so I went online to search for a recipe. I found several for stuffed kohlrabi using ground lamb, but that didn’t interest me. Finally, I stumbled upon a recipe by someone named Stephanie who had a blog with recipes that followed a paleo diet. I’m reposting her recipe here with some slight modifications. Warning – this recipe has some kick to it, so if you can’t handle spicy, don’t leave out the two types of pepper. 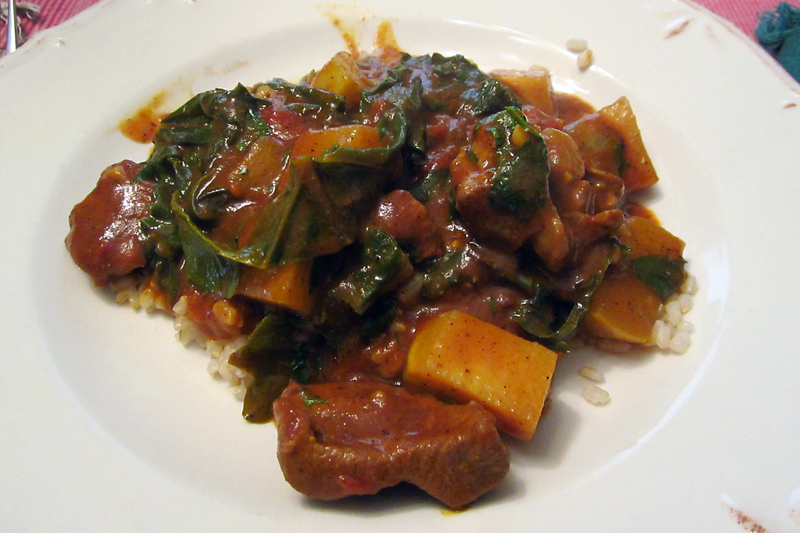 Note 1 – Instead of ground lamb, I used lamb stew meat. After browning it, I add the canned diced tomatoes and the meat to a pressure cooker and cooked it for 10 minutes to make it more tender. Note 2 – Instead of a 28 oz. can of diced tomatoes, I used a 14 oz. can and added two fresh Roma tomatoes that were diced. Brown lamb over medium heat in a large, deep skillet. Remove lamb from pan and set aside. Add onions to pan and cook, stirring occasionally, for a few minutes until they begin to soften. Add kohlrabi and garlic and continue to cook until kohlrabi is just fork tender, about 10 minutes. Add kale and saute until wilted. Add in all spices and stir for 30 seconds. Add tomato paste and stir well. Add tomatoes and stock, bring to a boil, then reduce heat and simmer for about 20 minutes, or until kale and kohlrabi have reached desired tenderness. Stir in cilantro. Serve over rice. Note – If your chili broth looks too thin, do what I did…stir a tbsp of potato starch into 1/4 cup of water until smooth. Add to simmering chili and stir to thicken.